Today's guest post by Chi-Hoon Kim is the first in our special series, Searching for Authenticity, which delves further into questions of what authentic eating and cooking means. For part two of the series (Bison on Everything), click here and for part three (Finding Traditional Food in Japan), click here. 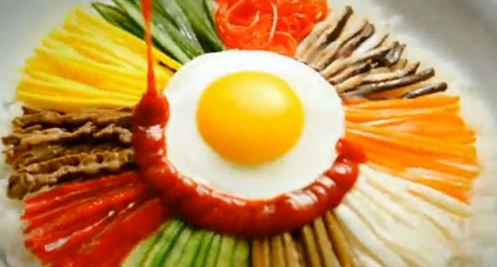 A typical bibimbap is presented as follows: on a bed of steamed rice, a variety of vegetables (called namul) and marinated beef are neatly arranged in a circle with an egg placed at the center. A dollop of gochujang and a swirl of sesame oil are added. The diner is expected to mix everything thoroughly. Literally meaning “mixed rice,” bibimbap is a flexible dish with regional, seasonal, and class variation. For example, a popular springtime version is a vegetarian saessak (raw sprouts) bibimbap usually served without an egg and dressed with soy sauce, and a summer favorite is yeolmu (young radish) kimchi on a bed of cooked barley, seasoned with soybean paste. In recent years, bibimbap has become the globally recognized South Korean national dish. 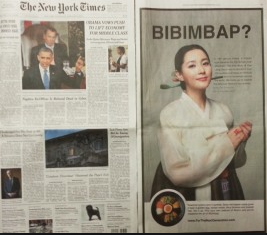 As the New York Times advertisement hints, bibimbap was eaten in the royal court of the Joseon Dynasty (1392-1910). However, this is only one of the several stories that explain the origins of the dish. Some think consuming bibimbap began as an effective way for farmers to share a quick meal in the fields. Others claim that bibimbap was first eaten during the Donghak peasant uprising in 1894 when the lack of bowls necessitated a simple communal meal. Still others argue that bibimbap was developed as a way to consume leftover food after ancestral ceremonies or on New Year’s Eve to ring in the New Year on a clean slate. Bibimbap is ubiquitous in and outside of Korea. The dish can be found in high-end restaurants, convenience stores, and on airplanes. Bibimbap has even been turned into military combat rations and space food. In everyday life, bibimbap is usually consumed as a quick meal or a solution to get rid of leftovers in the fridge. Bibimbap combines the most basic elements of Korean cuisine, which consists of rice and side dishes. In terms of bibimbap components, the rice is the stable grain in the Korean diet, the vegetables and proteins are prepared the way common side dishes are, and sauces are derived from traditional fermented soybean products. Since the story of bibimbap as originating from the royal court has become widely circulated around the globe, I decided to try out this “original” recipe. The oldest written record of bibimbap appears in Siuijeonseo, a cookbook written in the late 1800s that captures the culinary culture of the yangban class, the nobility during the Joseon Dynasty. The book contains common recipes used among the elite for ancestral ceremonies, celebrations, and other special occasions, and organized by cooking methods such as fermented, raw, steamed, grilled, dried, and pan-fried. 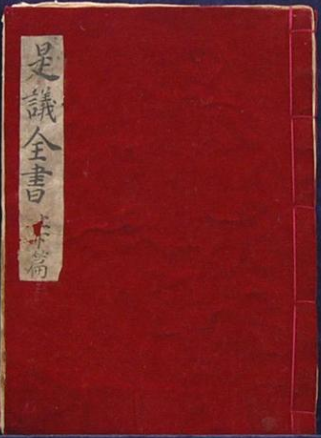 While the cookbook’s author is unknown, it is believed that the Shim household of Sangju, a prominent yangban family, has possessed this book since 1919. In Siuijeonseo, bibimbap appears as goldongban, which means dizzily mixing everything together. The recipe is as follows: Make rice, sauté marinated beef, and cut various gannap (pan fried fish, cow liver, or cow stomach) into bite-size pieces. Sauté various vegetables with seasonings and crumble good-quality fried dashima (kelp). Mix all the ingredients with rice, ground sesame seeds with salt, and sesame oil before placing everything in a bowl. Cook an egg into a crepe and slice it in thin strips for garnish. Form marinated ground beef into marble-sized beads. Dust the meatballs with a little flour before dredging it in egg frying them. Top the dish with the cooked meatballs. Armed with this recipe, I set out to recreate this dish. I could not find cow’s liver or stomach from the local grocery store so I settled on making fish jeon (pan fried fish) as my gannap. Contrary to contemporary bibimbap, the recipe does not call for gochujang or other seasonings except salt, sesame seeds, and sesame oil. I seasoned each vegetable and beef for the meatballs with scallion, minced garlic, salt, pepper, and sesame oil. I did not use any measurements but rather tasted and seasoned as I went, keeping in step with the Korean saying “taste of food comes from the cook’s hands.” The outcome was delicious but very different from the fiery bibimbap I have been accustomed to. The major difference in the dish’s presentation from the currently popular version was the mixing of all the ingredients together before topping it with meatballs and egg garnish. Contemporary bibimbap is assembled in layers so that the consumer can mix it right before eating it. However, prior to commercialization, bibimbap was pre-mixed to make it easier to serve or communally eat from the same bowl with multiple spoons. In the 1920s when bibimbap was first commercialized as a dish sold in restaurants, the presentation and serving of the dish changed. Pre-mixed bibimbap resulted in the rice becoming oversaturated and soggy so the ingredients were layered and separated. Bibimbap became a more interactive dish with greater consumer autonomy because the ingredients and degrees of saltiness and spiciness could be tailored to the diner’s preference. 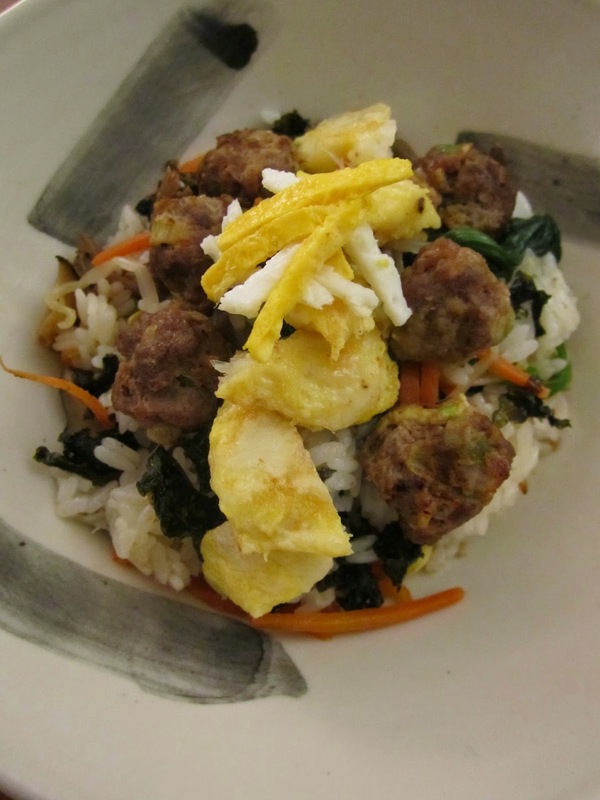 Customization has been the key to bibimbap’s persistence as a popular dish. Despite changes in preparation and presentation the dish remains an integral part of Korean cuisine. Contrary to the contemporary narratives of bibimbap, as seen in the New York Times advertisement, the contents and flavor do not make the dish distinctively Korean. While the ingredients, seasoning, and presentation of the dish can take on numerous forms, at the core, the mixing of rice with other ingredients remains constant. What makes bibimbap Korean then is the physical act of mixing that connects the culinary practice across class boundaries and generations. 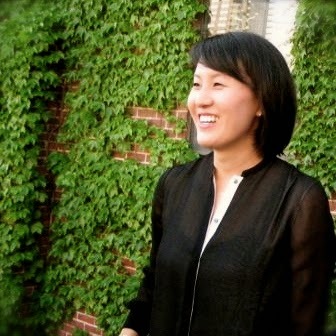 Chi-Hoon Kim is a food anthropologist based in New York City currently completing her Ph.D. dissertation on Korean gastro-diplomacy at Indiana University. Chi-Hoon holds a B.A. in government from Wesleyan University and an M.A. in anthropology of food from the School of Oriental and African Studies. Her research interests include in-flight experience of national cuisines, production of plastic food models, and globalization of kimchi.